Family screening of Academy Film Archive 35mm restoration print. 87 minutes. Beginning at 1 p.m., baseball snacks will be available in the lobby. Panelists: Little League Baseball players Ángel Macías and Pepe Maiz, Margot Pepper, daughter of producer George Pepper, and Los Angeles Dodgers alumnus Dennis Powell. Pepe Yñiguez, Spanish-language baseball broadcaster for the Dodgers, will give a special welcome. Directed by Hugo Butler. Produced by George P. Werker [pseudonym for George Pepper]. Screenplay by Butler, Edward Huebsch. 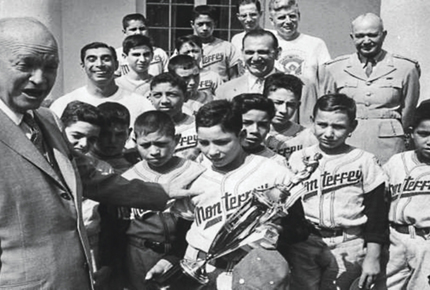 Los Pequenos Gigantes recounts the true story of the 1957 Little League World Series, the first featuring a team from outside of the United States and Canada. Despite their limited resources, the team from Monterrey, Mexico, won the series with the only perfect game in Little League championship history. Some of the players from the Monterrey team, including pitcher Ángel Macías, play themselves in the film. This rare screening in 35mm is from a print generously donated to the Academy by Jean Rouverol, the widow of writer-director Hugo Butler. After the screening of LOS PEQUEÑOS GIGANTES, children ages 9-15 can participate in a storyboard workshop led by storyboard artist Myke Bakich (The Book of Life, The Angry Birds Movie and Despicable Me 3). This community collaboration will encourage children to illustrate their own storyboards based around heroes in their own lives—either hometown heroes or broader cultural figures. Children will also have the opportunity to meet Angel Macias and Pepe Maiz, former baseball players from the Mexican little league team that inspired the film LOS PEQUEÑOS GIGANTES. Buy workshop tickets here. Space is limited. Exhibición familiar de la copia en 35mm de la restauración realizada por el Academy Film Archive. 87 minutos. Dirigida por Hugo Butler. Producida por George P. Werker [seudónimo de George Pepper]. Guión de Butler, Edward Huebsch. Elenco: Ángel Macías, Cesar L. Faz, José Maiz. Los Pequeños Gigantes (The Little Giants) cuenta la historia de la Little League World Series de 1957, la primera en contar con un equipo de jugadores fuera de los EE.UU. y Canadá. A pesar de sus recursos limitados, el equipo de Monterrey (México), ganó la serie con el primer y único “juego perfecto” logrado en toda la historia del campeonato de la liga. Varios de los jugadores originales fungieron como actores en la película, incluyendo el lanzador Ángel Macías, quien se interpreta a sí mismo. Esta exhibición presentará la copia en 35mm de la restauración realizada por el Academy Film Archive con materiales donados por Jean Rouverol, viuda del director y guionista Hugo Butler.